For the love of learning!! Frozen crockpot meals are great for busy days! First week of the workboxes! This was the first week of the workboxes in action while I was at work. They seemed to work out pretty well! The first day didn’t happen because we were without furniture and the puppy kept bugging Olivia every time she tried to do anything from her workboxes. The rest of the week went well though. She was mainly working on a map activity every day, telling time to the hour, addition, phonics, color by numbers, reading and writing. It is nice to have everything in order for what she needs to do for the day. I really like that about the workboxes. She has been bringing one of her reading books with her from her “All about Reading” curriculum everywhere to practice reading. 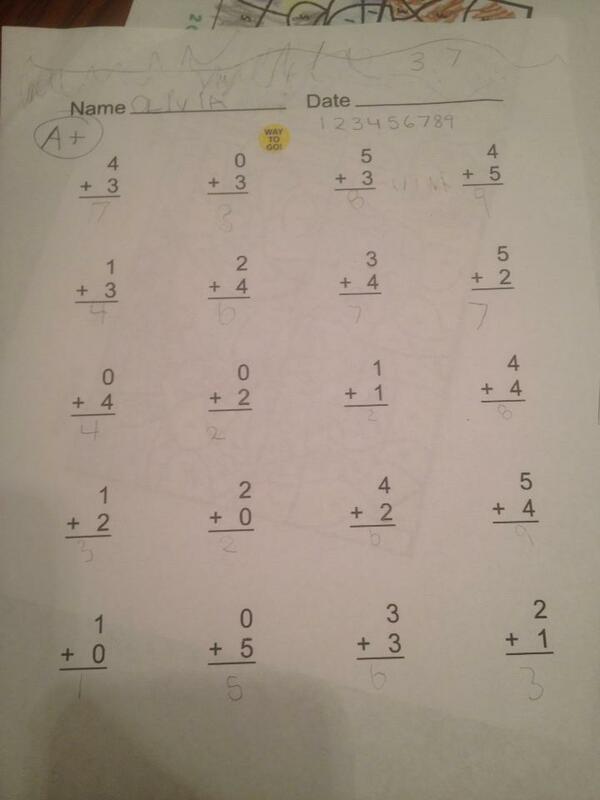 She has gotten to where she can do addition (single digits) by herself with no help. 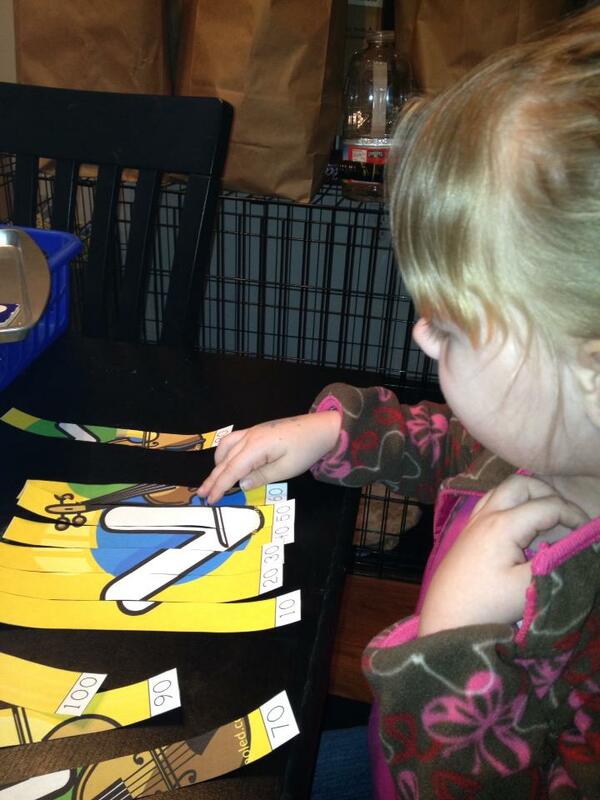 She needs a visual clue to what the numbers look like to write them correctly. These are some examples of her work from the week. I will be more detailed this weekend. I will have worked close to 50 hours this week in addition to doing my own assignments for school and participation (in school for a computer science degree). Tomorrow is a day I am working extra so I need to be up early (so up at 5:20am after working until 11:30pm). So far success for the workboxes though!! 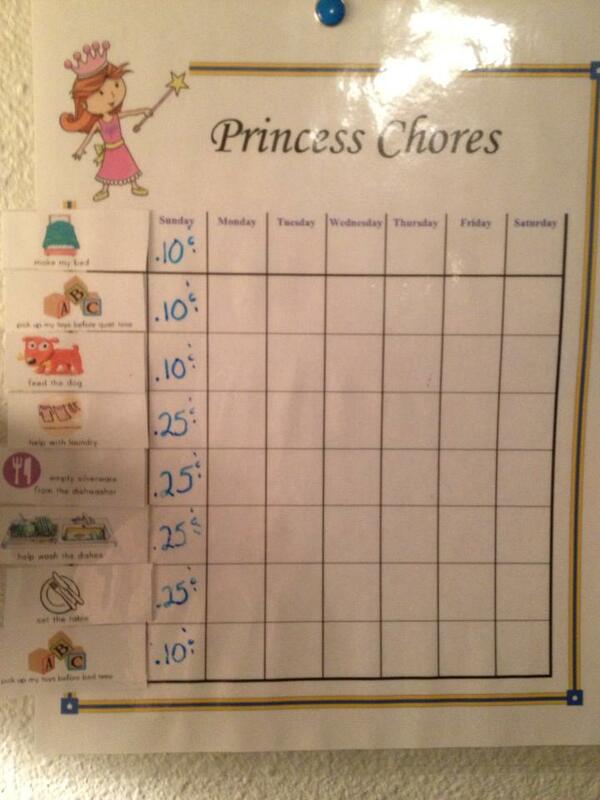 Also the chore chart is working out great. She has been earning on average about $1 a day. 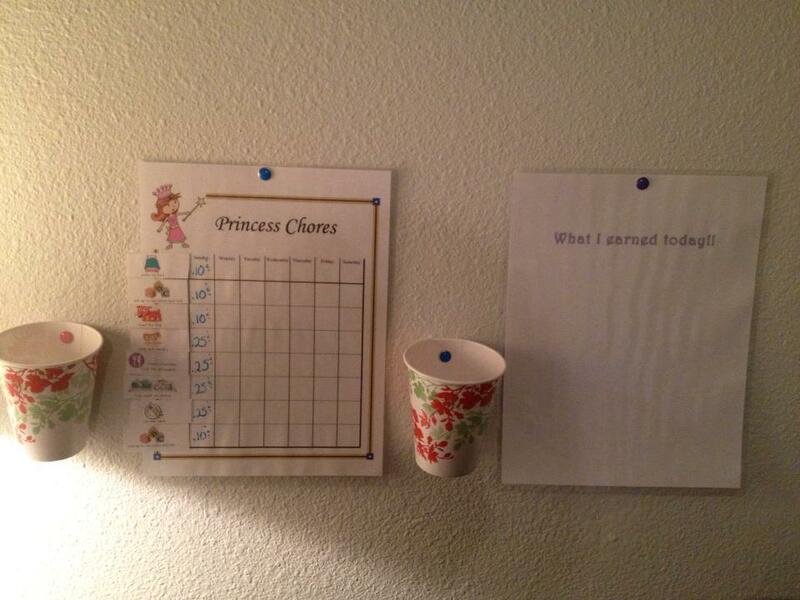 Tonight I decided to make my daughter (4.8 years old) a chore chart for the living room. Since she can’t read yet I figured it would be more effective to use pictures instead of words. My husband bought me a laminator for Christmas (which I hadn’t used yet) which I used to create this setup. Step 1: Olivia does her chores (in any order). As she does each chore she crosses off the chore done for that day and chooses the correct plastic (well laminated paper coins) coin from the cup on the left. She puts that coin in the cup on the right. Step 2: Olivia does each chore throughout the day until they are completed. Step 3: After all the chores are completed Olivia counts the coins and writes the total amount we owe her on the sheet on the right (she will need help with this part for awhile). Step 4: After I get home from work I trade Olivia’s play coins out for real coins for her piggy bank. 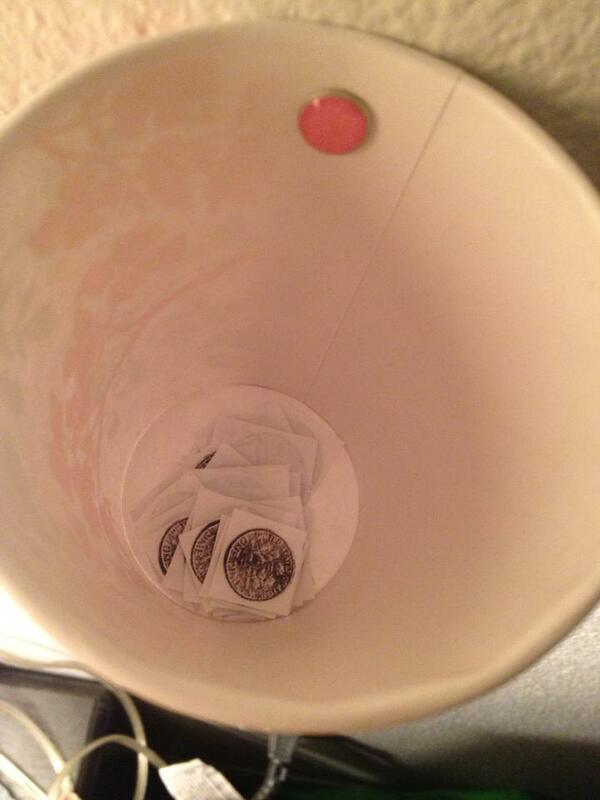 Then the earned coins go back into the cup on the left. Okay, so Sunday is usually pretty busy for us, no much relaxation going on over here! We woke up and got ready for the 11:00 church service. Olivia woke up first and immediately got into her workbox with the lanyard and beads because she wanted to make me a necklace. We then left for church. The service was very nice and thought provoking. 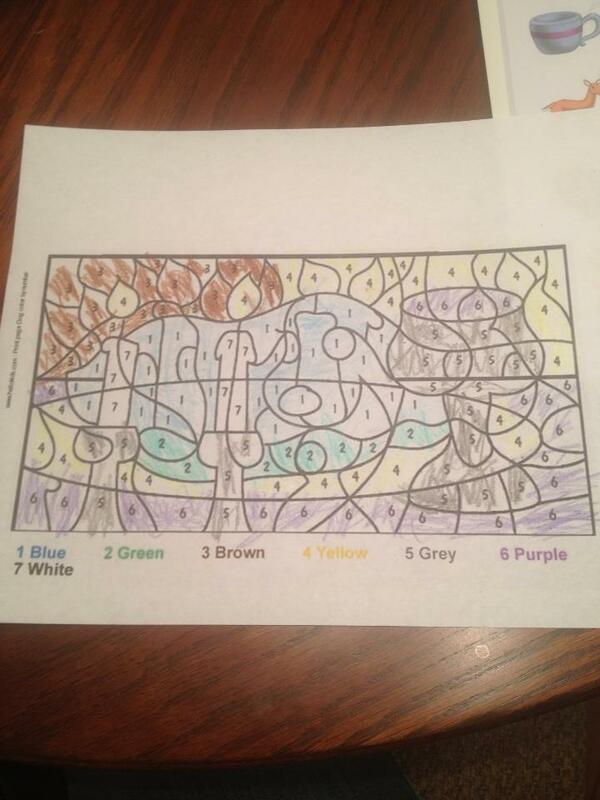 Reminds me that I need to read my bible more….Olivia had fun at Sunday School. She always does though, she loves going to church. After church we stopped at Krispy Kreme for some Sunday doughnuts. Very delicious, of course not the healthiest either. We decided to stop by the produce store on the way back home so we didn’t have to do it later. Most of my veggies are bad so I bought some mini artichoke, carrots, potatoes, broccoli, cauliflower tomatoes, pears and a tomato plant. We’ll see how the plant goes lol. At home I immediately put some chicken in the crockpot, I will be making chicken teriyaki and rice with maybe a side of asparagus. Olivia wanted to play on her k5learning.com site for a bit (she calls it her math school) when we got home. I set the timer for 10 minutes and told her she needed to start going through her workboxes after that. 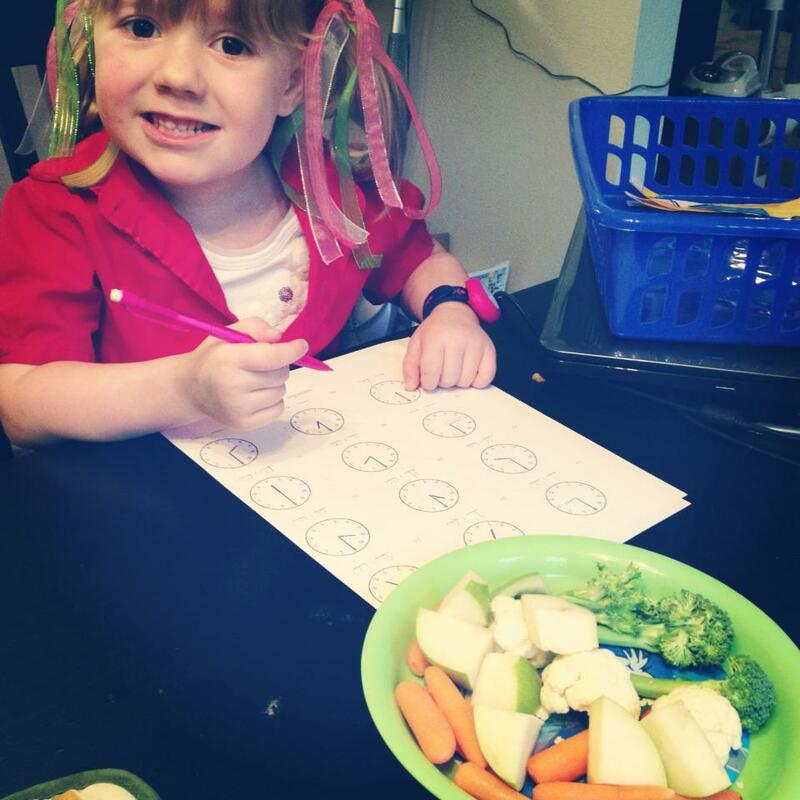 Her first workbox just had two worksheets on telling time. She did those quickly while I was unloading the dishwasher and Ryan (my husband) was watching the Cubs game. She got everything correct on those. Right now the worksheets are just going over time to each hour (ex. 3:00, 1:00, instead of 3:30, 2:30). Next week I will probably introduce it to the half hour. Her second workbox she played wiith for awhile. It had her pattern blocks in it. She made many different pictures with her blocks while I was loading the dishwasher. 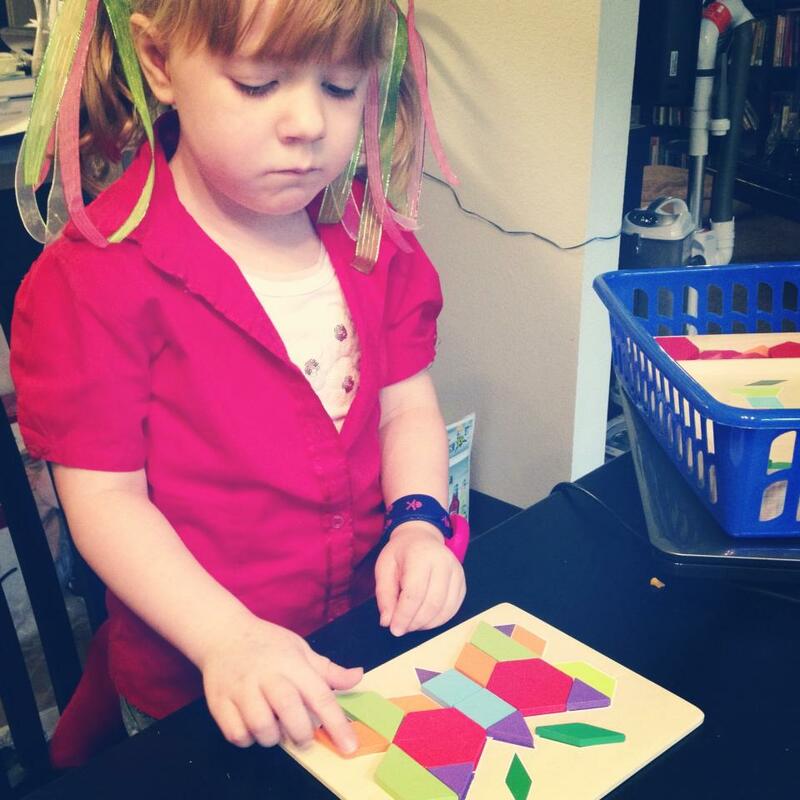 She does really like playing with her pattern blocks though. Her third box for the day had two different activities. One she had to cut out pictures at the bottom and glue them back onto the paper to complete a pattern. She did very well with this. 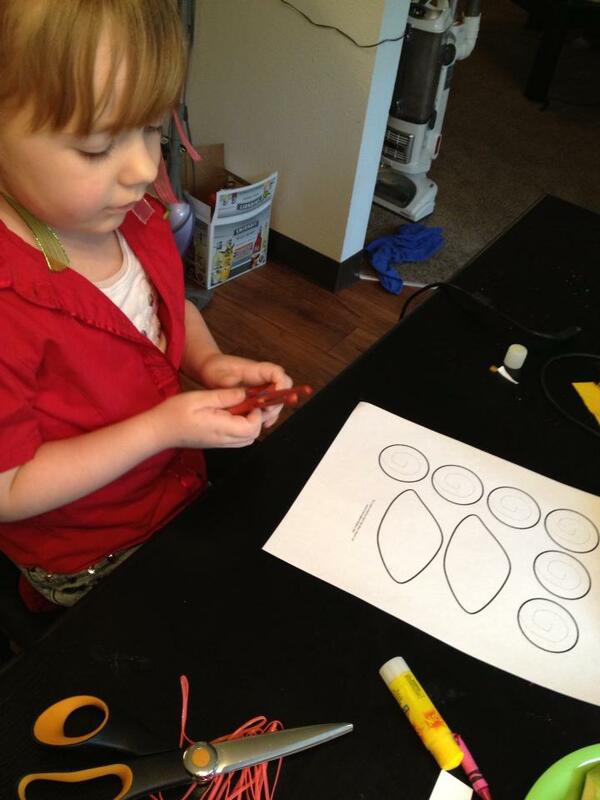 The next worksheet just had her circle things that the sun helps grow. The 4th box she had trouble with. She eventually gave up and refused to finish it. She was supposed to color and cut out parts to glue together to make a sheep head. She eventually got frustrated with the cutting and refused help and didn’t want to finish the project. I let her move on to the necklace after this because she really wanted to finish making my necklace. 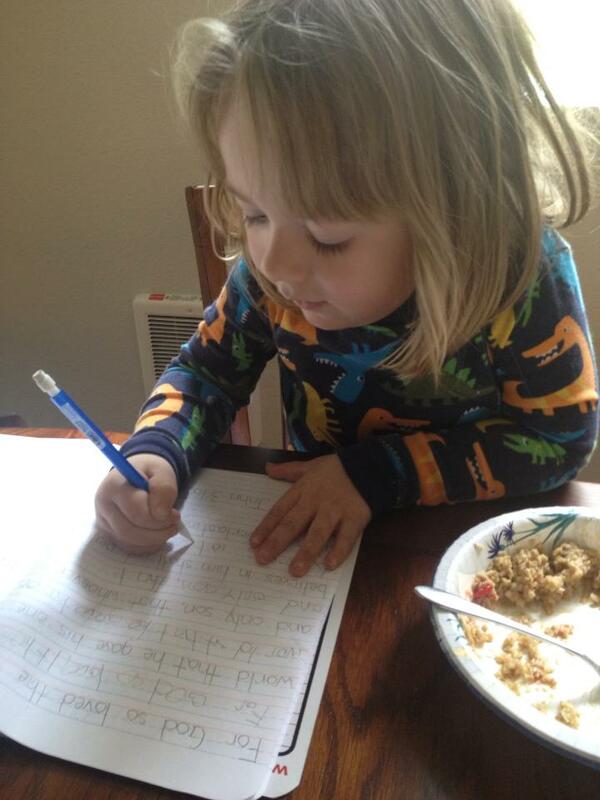 All she has left for the day is some phonics (write the first letter of the word) and her scripture copywork journal. I tried to get her to do a workout from a kids workout video on youtube but she wanted to do her workboxes instead. I’m guessing when I leave to go workout later she will want me to turn on the workout video for her as well. We still have to do our weekly grocery shopping later as well. We are pretty low on….everything except vegetables. We just wanted to get home for a bit so we didn’t leave the dog in the crate for so long. I also need to completely clean all of the furniture. The furniture company is coming tomorrow to pick up the furniture. The company I was working for provided my furniture but now we took over the apartment lease and are doing our own housing. Rent a Center is supposed to come on Tuesday and drop off our new furniture. I’m excited for our new couch too. We are only need the furniture for a short time and we are planning on buying furniture when we move to Texas in August/early September. We are not going to rent a dining room table though. We are planning on buying that ourselves. We may have to eat in the living room or at the counter until we get it in the mail though. I believe when the cubs game is over we will be leaving for grocery shopping. Now is the time for matching! 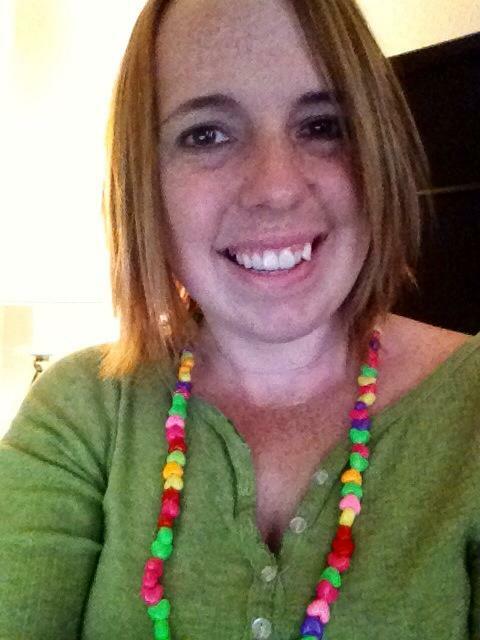 And here is me with the necklace she finished for me! Pictures from our first day of using the workboxes! Today was the first day we tried out our workboxes. My daughter is 4 1/2 and did very well. She was so excited that she went through all the boxes with no breaks. Tomorrow I will have put a card in one of the boxes for “youtube kids exercises for 1/2 hour”. I took a few pictures of her doing some of the work. The next picture was her learning to tell time. I just bought her a watch today at Burlington Coat Factory. She is constantly stopping to check her watch to “see what time it is”. She actually did very well with these activities. 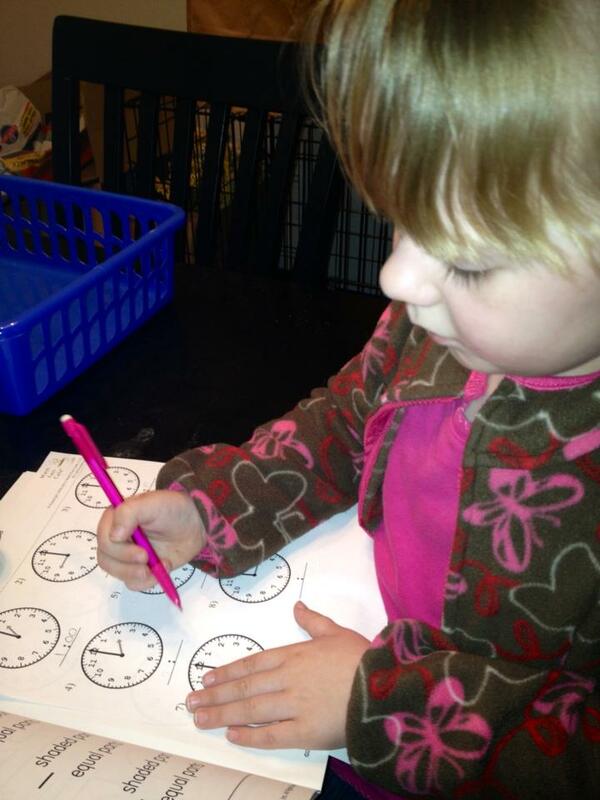 A second worksheet had her drawing the hands of the clock pointing to the correct time. This next picture is our little science worksheet. She had to cut out pictures of living and not living things. Then she had to glue them to the correct box. It took a lesson on living vs. non-living things but she finally got it. 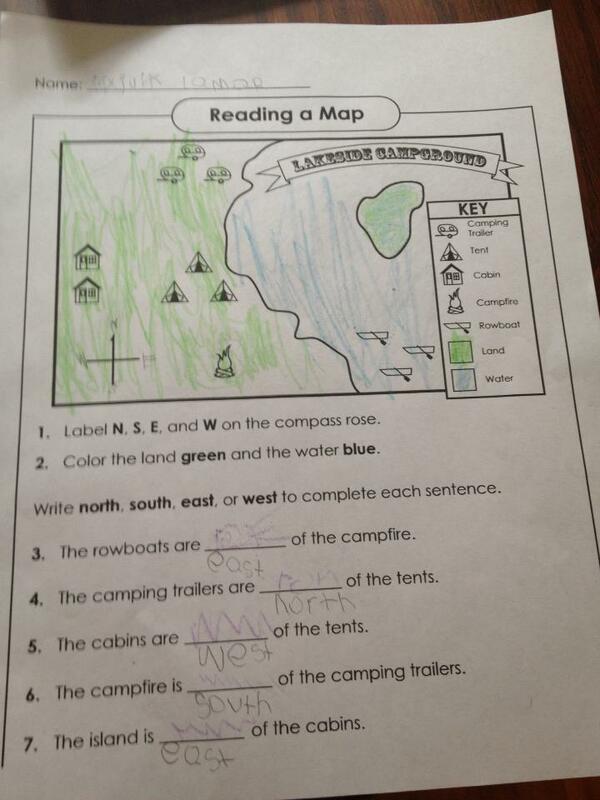 There was another worksheet to compliment this one as well (the one under this one). 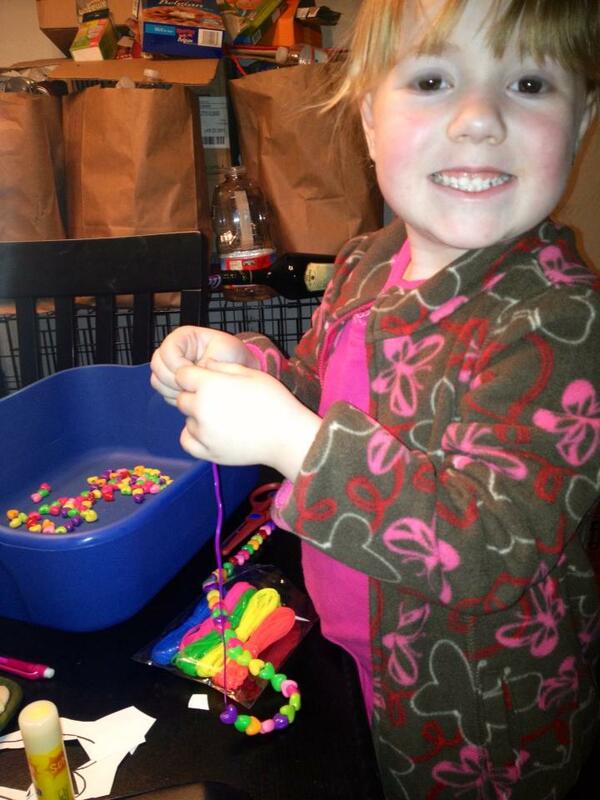 And finally she made a “beautiful necklace” out of beads and lanyard string (from the dollar tree). There were also more activities she did but these were the few I took pictures of. Yesterday I decided I was going to try to implement the workbox system I have seen on many other homeschooling sites and blogs. I wasn’t able to find any wire shoe racks (which is what I originally was planning on using to make the workbox center with) so I found a bookshelf at Goodwill for $6.99. I also bought a few bins at the dollar tree (we already had 3 of the same bins). I also bought a bunch of goodies at the dollar tree. I bought some new workbooks, craft supplies, and post it notes. At home I immediately got to work on my new workbox system. I put the bins on the shelves (so I have a total of 8 bins for the day). Right now she is 4 1/2 and will be starting Kindergarten in the fall. She has been begging to do school each day though so I though we could start the workbox system to practice before we officially start Kindergarten. I put different activities in each box. 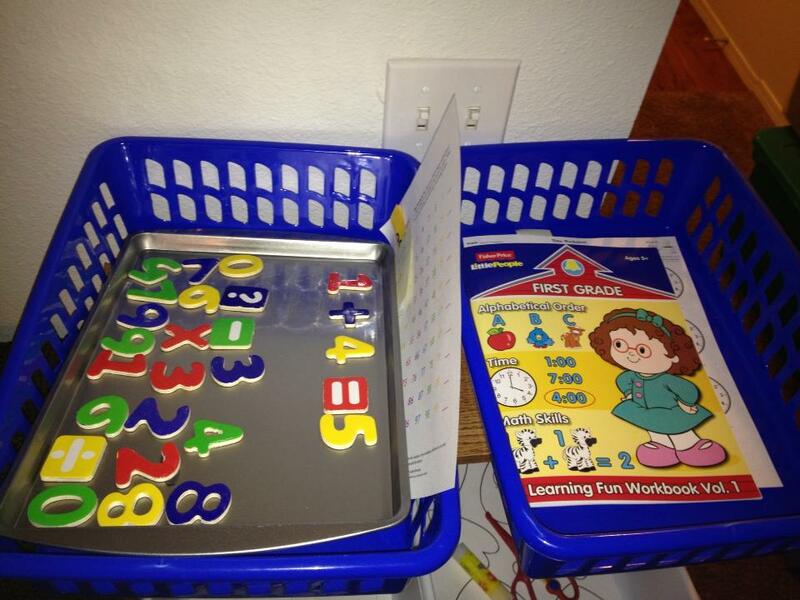 In the first box I put a cookie sheet with magnetic numbers (both bought at the dollar tree), to be used to make up and solve math problems. I also put in a skip counting puzzle (a picture cut into strips with the numbers 10-100, skipped by 10s, on the bottom of each strip). 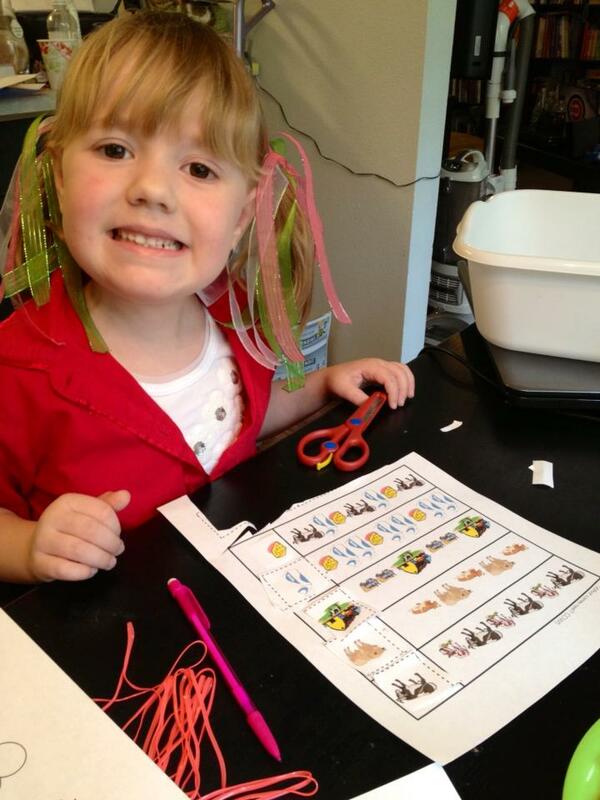 She put the strips together in order to create a picture. 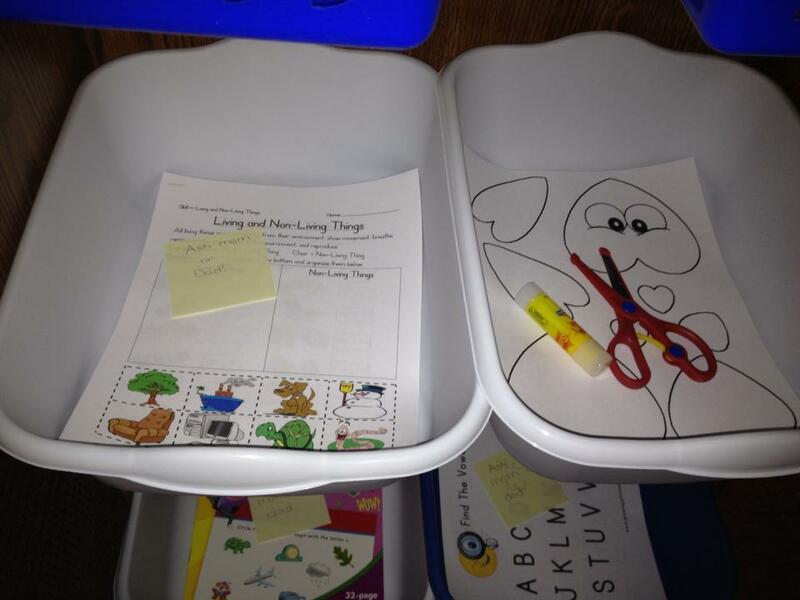 The 2nd box contained a telling time worksheet inside of a workbook with a page marked to do, the other page was to draw the hands on the clock for what time is printed below. The third box (which is what she is working on as I am writing this) is a science activity. It is called “living or non-living things”. She is to cut out squares on the bottom and glue them into the appropriate box whether it is living or non-living. 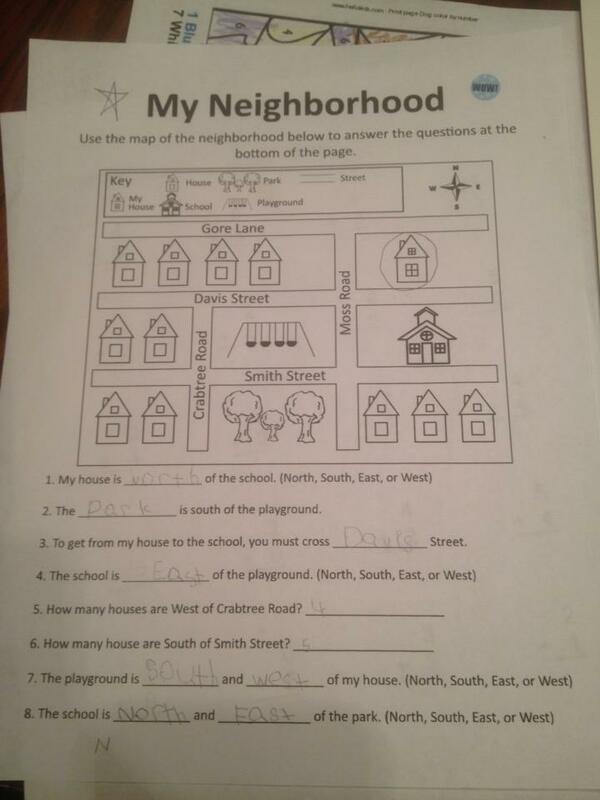 Then there is another worksheet where she just circles yes or no if the picture is living or non-living. The 4th box contains an arts and craft activity. She cuts out many different hearts and glues them together to make a dog. She needs to work on her cutting skills so I will be adding plenty of cutting activities each day. 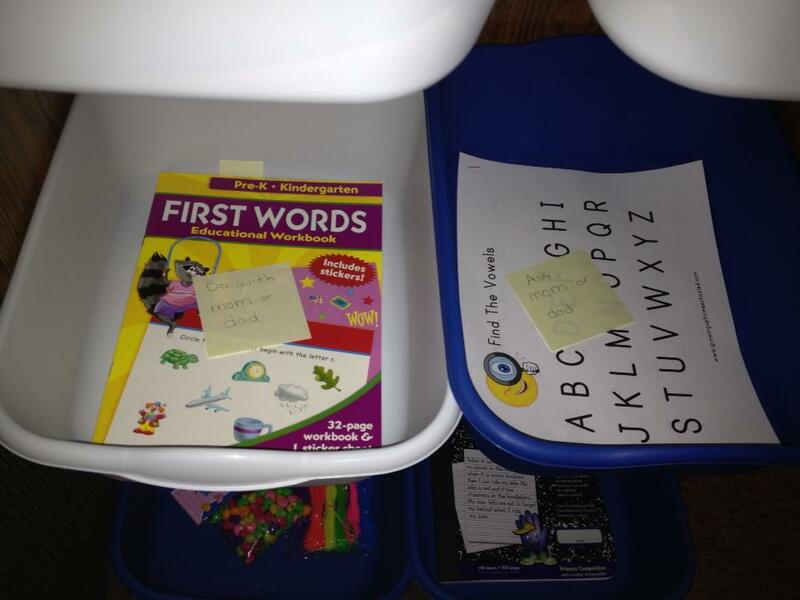 The 5th box has her phonics workbook with 1 page marked. The page has a word and a picture. 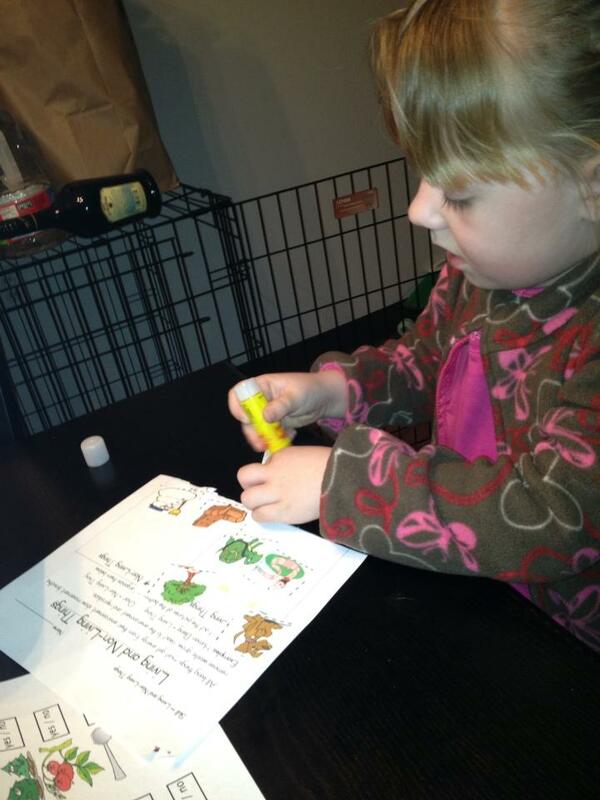 The first letter of each word is missing and she has to figure out the letter and write it. The 6th box contains just 2 worksheets for vowel recognition. The 7th box contains a beading arts and crafts project. The 8th box contains her copywork journal, where she copies scripture to practice her writing and penmanship. This was just a trial run for today. I will be planning out this entire next week’s worth of work for her to do on Sunday. 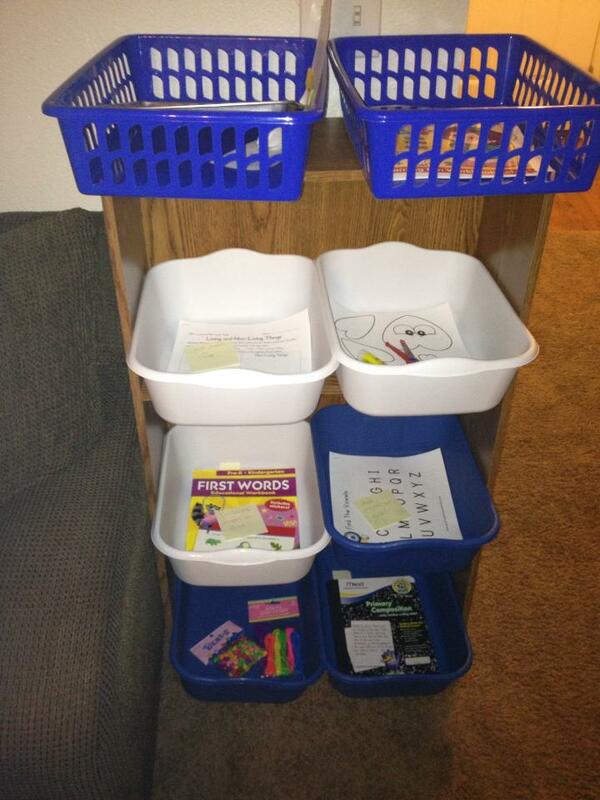 This will make it much easier to have things organized for the week. Plus when Olivia is begging to “do school” I can direct her towards her workboxes. It will also make it easier for my husband since I work 10 hours a day. I can have everything set up for him and all he needs to do is help her if she needs help with an assignment. This is just day 1 but I am hopefully that it will work well for us! Angie on Our new workbox system!